Satin Roses for centers of Rosettes Antique White, Burgundy, or Dusty Rose and custom colors .25 each. Watch for new page coming soon with custom-colored lace trims, Venise lace medallions, embroidered sheer shaped medallions and other exciting possibilities for Victorian lampshade panels. 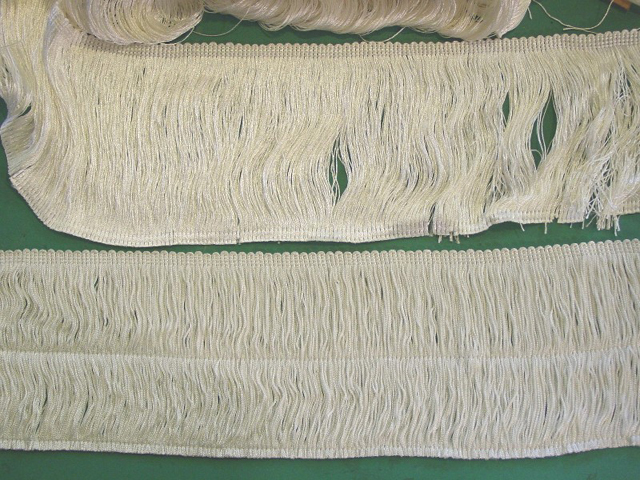 The chainette fringe you buy in fabric stores is thin, generally what they call "2-end". Mine is "4-end" which is twice as thick. Considerable savings for twice the quality! TEMPORARILY OUT OF STOCK - WAITING ON MANUFACTURER! GLASS 'SUGAR BEADS' $5.00 per Cup (Average sugar shade takes approximately 1/2 to 3/4 cup) Because of weight, postage is $4.25 per cup to ship these!) Least expensive is to include these when shipping oversized boxes of frames, as UPS and the Post Office will charge as if the box were 30 or 70 pounds anyway. DYEABLE TRIMS SHOWN BELOW HAVE BEEN DISCONTINUED UNTIL WE FIND NEW SUPPLIER. Harps - all sizes in stock. Call for prices. #9 SOLD OUT OF ROSE PINK. #10 1-1/2" wide, Off-White only, . Dyes beautifully. Click here for Instructional Video on "How to Make Victorian Sugar Shades"
click on thumbnail pictures to enlarge. These are only a few of the decal designs we have in stock for Sugar Shades. When time permits, we'll put more pictures up here. We have sailing ships, wild animals, big game, dolphins, windmills, Oriental scenes, Victorian ladies, lots more flowers, angels, lighthouses, country scenes, and many others which work quite nicely with the sugaring process.